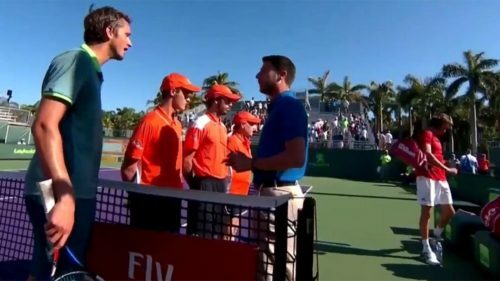 Tempers flared at the Miami Open on Thursday as rising stars Daniil Medvedev and Stefasnos Tsitsipas were involved in an altercation during their first-round match. According to reports, it all started after Medvedev took an emergency toilet break at the end of second set. Following the third game of the deciding set, it was Tsitsipas who did so. Even as the action resumed soon after – with Medvedev pulling off a 2-6 6-4 6-2 win – things took to an ugly turn following the handshake at the net. Apparently, it was Tsitsipas who said something that didn’t go down well with his Russian opponent, who did all the talking from thereon. Irked by his Greek opponent turning a blind eye, Medvedev said: “Hey Stefano, do you want to look at me and talk? You don’t look at me? “You go in emergency toilet for five minutes, you hit a let and don’t say sorry, you think you are a good kid? ‘Look at me, look at me huh! You don’t look at me? Subsequently, the chair umpire had to show up and pacify Medvedev before Tsitsipas left the court.